A Vehicle Air Conditioning Regas (also known as Air Con recharge or Air Con Service) is a process to recharge your vehicle air conditioning system to either get your air conditioning working and / or ensure optimum efficiency. Modern car air conditioning systems contain refrigerant and should be regassed, recharged, serviced on average every two to three years. Only people with the correct vehicle air conditioning licences should undertake this. 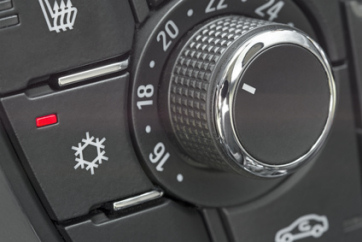 Vehicle manufacturers recommend this frequency in order to prolong the life of the air conditioning components (i.e. compressors and condensers, which can be expensive to replace) and maintain efficiency. What is involved in a Car Air Conditioning Regas / Service? 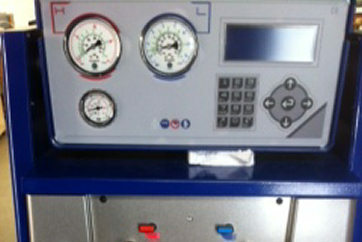 A system pressure test is always undertaken first. A leak test is then carried out on any vehicle where the pressure is low. The leak test is performed using specialist nitrogen leak testing equipment which safely identifies the presence and location of any significant areas of leakage. The next stage is to safely remove any refrigerant still present in the vehicle air conditioning system. Failure to safely remove refrigerant could result in refrigerant gases being leaked into the atmosphere damaging the environment, breaching environmental legislation and potentially causing a safety hazard. This stage is extremely important. This process lowers the pressure of the system to such an extent that it "boils off" any moisture in the system, thus leaving the system in a completely clean state. Moisture in the system is one of the main causes of air conditioning faults. The next stage in the process is to add Oil and UV dye into the air conditioning system. Oil is added to ensure the system has adequate lubrication to the air conditioning compressor to reduce the risk of future compressor failure. Due to the difficulty in detecting very tiny leaks (which are unable to be picked up in stage 1), then UV dye in the system allows future fault detection should the leak persist or a new leak develop. This could save the customer time and money in future diagnosis costs. We are now at the stage where the new refrigerant (gas) can be added to the system. It is vitally important that the correct amount of refrigerant is added to the vehicle as too much or too little will negatively impact efficiency. It is also critical that the correct type of refrigerant is used as different cars have been manufactured using different gas (R134a, R12 or R1234YF). Failure to use the correct gas cannot only seriously damage your vehicle but could also be a breach of strict vehicle air conditioning laws. We offer a competitively priced Regas Service, please contact us for more information.